2017 marks an important election year in Germany. The three recent German Land elections seem to give a good idea about the dynamics of the upcoming federal election scheduled for September 24 2017. Hence, in this blog post, I comment on the prospects for the election to the Bundestag in light of the latest Land elections’ results. Thus far, vote choices at the regional level seem to indicate that the two major parties, the Christian Democrats (CDU/CSU) and the Social Democrats (SPD), find themselves in the position to form yet another Grand Coalition at the national level in fall. Departing from a low 25.7 per cent score at the 2013 federal election and weak approval rates in the polls, the Social Democrats had a strong start in the pre-campaign period at the end of 2016. First, the party leader and minister of the Economy Sigmar Gabriel at the time managed to impose his party colleague Frank-Walter Steinmeier as the Grand Coalition’s candidate for the federal presidency. Then, in the ensuing reshuffle of party and cabinet positions, Gabriel surprised the party and public by nominating Marin Schulz to be the SPD candidate for position as Chancellor. As former president of the European Parliament, Schulz has never been member of the Grand Coalition cabinet. He was able to convincingly promise a fresh start and make Chancellor Merkel look exhausted. 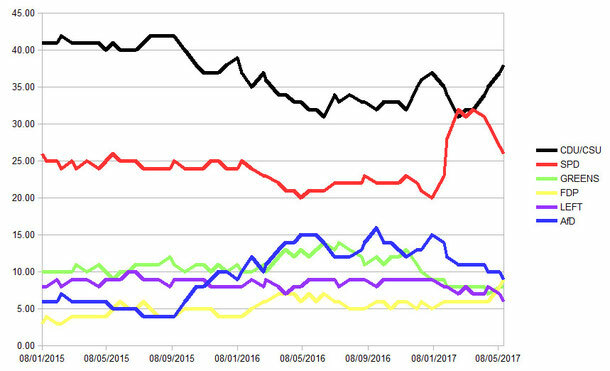 The ensuing “Schulz effect” gave much needed inspiration to the SPD, bringing a positive dynamism to its campaign initiation. When Christian Democrats were confronted with Schulz as Merkel’s SPD contender, they had already passed a long valley of tears. Since their former coalition partner, the Free Democrats (FDP) failed to pass the threshold in the 2013 Bundestag election, the Christian Democrats had to form the third Grand Coalition in the history of the Federal Republic. At the same time, CDU/CSU were coming under pressure from the right: the 2013 Bundestag election had seen the rise of a new populist party, the Alternative for Germany (AfD). In this situation, Merkel, leading a government that made considerable policy concessions to the centre-left coalition partner, on September 5 2015 decided to open German borders to refugees stuck at the Hungarian border. This gave rise to growing popular discontent, open resistance inside Merkel’s CDU, and continuous frictions with its Bavarian sister party, the CSU. The Land elections immediately following the opening of the borders seemingly proved these critics right. The CDU lost twelve percentage points in Baden-Württemberg, thus far considered a Christian Democrat stronghold in the prosperous South-West. Finishing second after the Greens, the party was forced to enter a coalition as junior partner of the Greens. Next, in Sachsen-Anhalt, the AfD finished second after the CDU with nearly one quarter of the votes. In the regional election in Berlin in September 2016, the CDU lost its position as junior partner of the Social Democrats, with only 16.6 per cent of the votes, just 3.5 per cent points more than the AfD. The most traumatic CDU experience, however, was the regional election in Mecklenburg-West Pomerania, Merkel’s home Land, on September 4 2016: the Christian Democrats received nearly two percentage points less than the AfD and close to twelve percentage points less than the SPD. Contrasting the apparent SPD’s recent boom and the CDU’s agony, the three Land elections in spring 2017 paint a different picture. In all three Landtag elections, Social Democrats lost popular support and were even voted out of government in two cases while Christian Democrats triumphed. Despite the expected “Schulz effect” and positive poll numbers, the Social Democrats failed to take over prime minister’s office from the popular CDU incumbent in the first Land election of 2017 in Saarland. In fact, the CDU, compared to the preceding Saarland election, increased its support by more than five per cent points to above 40 per cent and attracted approximately 10 percent points more votes than the SPD that ended up with 29.6 per cent. This year’s second regional election, in Schleswig-Holstein on May 7, saw the three parties in government – the Social Democrats, the Greens and the SSW, the party of the Danish minority – lose a combined 5 per cent points of the vote and their majority in parliament. However, the Christian Democrats with an increase of 1.2 and the Free Democrats with a gain of3.3 per cent points were not able to win a majority of seats either. The AfD, a first-time participant, obtained 5.9 per cent of the vote and thus entered its 12th Land parliament in its short history. It is thus able to force the other parties to form either a coalition made up of three parties (SPD or CDU with Greens and FDP) or another Grand Coalition. This result does not yet give the expected boost to the Christian Democrats’ campaign for the September federal election, but it neither sustains the Social Democrats’ hopes of a “Schulz effect”. In this situation, a lot of the SPD campaign dynamics depended on their standing in the regional election in North Rhine Westphalia (NRW). NRW is the hot spot of the “old” German economy with its mining, iron, and steel industry and by far the largest and most populous German Land. In the last five years, Martin Schulz’ home land has been governed by a red-green coalition led by Hannelore Kraft. But even though Kraft was a popular Premier, her coalition could not defend its parliamentary majority, losing a combined 12.9 per cent points of the vote. And even though the AfD entered the Landtag, Christian and Free Democrats won a one seat majority which allows them to form a centre-right government in the Social Democratic heartland. These recent elections seem to indicate that at the federal level, a government without the conservatives is unlikely. Whether Germany will become the next Grand Coalition state largely depends on the developments among the AfD and the other small parties. The AfD’s chances in next fall’s election have suffered somewhat recently (see Figure 1). Meanwhile, the two current Bundestag opposition parties, the Left and the Greens, score between six and eight per cent, while the Free Democrats, after their setback in 2013, can hope to return to Bundestag with rising numbers in the polls, now reaching nine per cent. And the more parties enter parliament, the more difficult it will be to form a government other than a Grand Coalition.